On Tuesday 16th October the borough’s unsung heroes were recognised at the Solihull Civic Honours Awards ceremony. The event, which is in its eighth year, took place at Solihull Council’s Civic Suite. 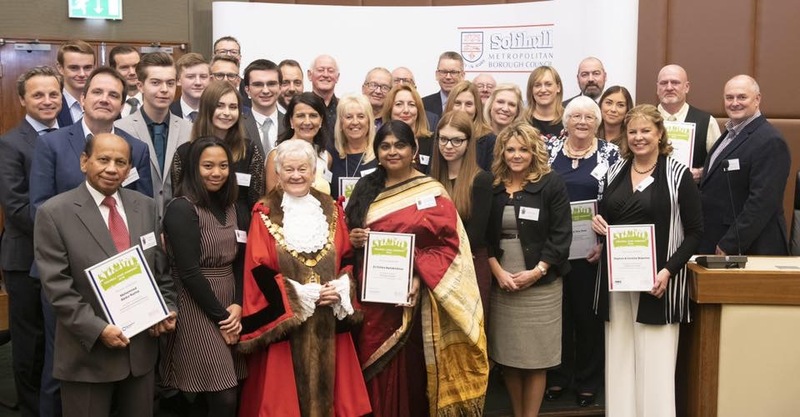 Winners were invited to receive their awards from the Mayor of Solihull, Councillor Flo Nash, and to meet sponsor representatives from local businesses and organisations. The ceremony also featured a performance by Sing!Bentley Heath, a local community choir. Over recent months Solihull residents were invited to nominate people who have helped to make the community better. The judging panel of councillors, officers, representation from community groups and the main sponsor were then left with the tough task of reviewing the list of nominees and selecting this year’s winners. The Mayor said: “It was a lovely evening and one of the highlights of my mayoral year. “I was delighted to have been able to meet these marvellous people and to thank them for their dedication, hard work and enthusiasm in helping to make Solihull such a wonderful place to live. Dr Chithra Ramakrishnan is the Founder and Artistic Director of ShruthiUK. She has been instrumental in taking South Indian Classical Dance in Solihull and across the Midlands more accessible through holistic healing for mentally and physically challenged children and senior citizens with Autism, Dementia and Alzheimer’s. She launched the British Carnatic Youth Choirs for schools with a vision to unite Britain through Carnatic music and reinforce British values in schools. Chithra is an active supporter of several charities & has raised funds for humanitarian causes for charities in the UK. Mohammed has been a Parish Councillor for 17 years in total serving 10 in the Smith’s Wood part of Solihull and the last seven years in Castle Bromwich. His nomination recognised how Councillor Rashid goes above and beyond what is expected of a Parish Councillor. He is well respected by the whole of the community for his kindness, support and for tirelessly helping those in need within his local area and in Bangladesh. Friends of Damson Parks Group was started six years ago because local people were tired of the park having no formal pathways. After much hard work, in April 2018 the group achieved their ambition and there is now a public footpath all around the park. This is now widely used by many people in the community. The committee has also installed flower beds and a sports wall. Friends of Solihull Station was formed October 2016 and the group ranges in age from 21 to mid-70s. Over the last two years they have made a huge difference to Solihull Station and its community. Their aims for the future are to provide a sustainable project for the cleared, disused platform that includes an element of art/sculpture and establish a higher profile in the community and with rail users. Peterbrook Players are an amateur dramatics company and have put on productions at The Core for the last 34 years. Stephen took over as Chairman when the company was in difficulty and drove it onwards with care, attention, passion and love. This wasn’t a lone operation as he was supported by his wife, Caroline. After they were nominated for this award, Stephen passed away following a battle with skin cancer. The award was presented to Caroline, who was accompanied by their four children. Mikey has grown up with verbal dyspraxia. This condition left him unable to make himself understood to anyone outside of his family until he was eight years old. At age 13, he set up Mikey’s Wish to raise awareness of verbal dyspraxia. He also raises money to support other children with additional needs. He raises money by selling merchandise, holding non-school uniform days, cake sales, and pub quizzes. He has raised over £8000 so far. Samuel became a young carer at the age of 10. He helps his family care for his brother, who has ADHD and autism. Samuel, who has Tourette’s, spends his spare time as a Peer Mentor for Carers Trust Solihull through a Children in Need project. He is involved in a number of other community based activities including helping his Mum who runs a local charity supporting families of children with Autism. He is also a young leader at his local scouts group and is an active member in a historical re-enactment group. Lee Fletcher has been outstanding in creating facilities at the school where he works, Kingshurst CTC. His approach to partnership working and community has enabled many people to benefit. He has been instrumental in the construction of a mock WW1 trench on the school site, which thousands of school children have been able to visit. He also established the school as the first Children’s University Learning Destination in Solihull. This programme instils in young people a passion for extra-curricular learning and helps towards their UCAS application. This year 600 Solihull children graduated from the programme. Val and Tony have dedicated over 42 years to Solihull Swimming Club for the Disabled. Beginning as volunteers they have gone on to be committee members, trustees, and patrons. They remain active with the weekly sessions by helping out in the pool, acting as stewards, and assisting the lifeguards. Furthermore, they arrange events for club members including away days, holidays, and parties. Paul has been a coach at Solihull Amateur Boxing Club for over 18 years. He is an exceptional Head Coach and is also fully qualified as a judge and referee. Through his outstanding commitment to the coaching of boxing, Paul has instilled the ethics of discipline, respect, and fairness to his charges. He has also extended a warm welcome to many young asylum seekers in temporary housing in the area.